MEMBERS ENJOY THESE BENEFITS ! 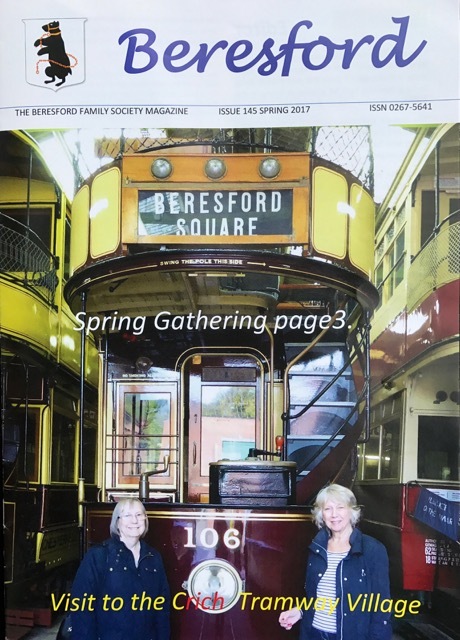 Our Beresford Magazine (published each quarter in Spring, Summer, Autumn and Winter) is free to Members. It contains fascinating stories of our Beresford history, going back over six centuries, achievements of past Beresfords, news from overseas members and information on our Spring and Autumn Gatherings. It brings members up to date on research matters with regular reports and articles by our research team. We welcome articles on subjects that will be of general interest to members. But first contact the editor, Marguerite (beresfordeditor@btinternet.com) with your proposals, plus any photos, as there are limits to the overall length of articles, which ideally should be around 500 words. The Editor also welcomes your ideas for new features, new content and other comments so that we can truly reflect the views of our members on the Members’ Page. It would be a great help if you could send us any details of your family tree (with dates) in case we can link it up with other pedigrees or even with the main line descending from Thomas & Agnes. Our small volunteer team of researchers has assembled a mass of pedigrees, based on church records, census returns, wills and old deeds and is always willing to help members of the Society with their own research. More volunteers needed. Particular emphasis is placed on social activities for our members with our Spring and Autumn Gatherings which are held every year. These consist of visits to some of the most historic places in the country, some with Beresford connections. We have enjoyed many tours through impressive buildings, admiring beautiful interiors, fine craftsmanship and great works of art. See 'Members' Events' for past visits. These weekends provide a good opportunity especially for new members to meet others and usually include a Dinner together on the Saturday evening and a Sunday morning programme before leaving for home. We have also in the past held three 10-day International Gatherings, visiting ‘Beresford country’ in Derbyshire, Curraghmore (the seat of our President, the Marquis of Waterford in Ireland) and London landmarks with a Gala Dinner in the Palace of Westminster and tours of both Houses of Parliament. Simply click on PDF for an application form. Print off a copy and complete all sections, then post it with your subscription to our Membership Secretary, John Beresford (address on the form), or fill it in on your computer and send it as an email attachment and pay by Paypal. (If you have trouble opening the file get a pdf reader - both adobe reader and foxit pdf reader can be downloaded free). The annual membership subscription is £15 p.a. for UK members and £20 for Overseas members (due to higher postage costs). This one subscription provides Society membership for each individual member of the family (husband/wife/partners/children under 18).